Snow fell almost all day yesterday. Cabin fever set in over night and today I just had to get out and see the world. That sounds so much more dramatic than it really is, I live in the suburbs of a huge city, and can walk to 4 different coffee shops if I wish... However, Cabin fever can still find you in the suburbs, and to fight it off, today, I went out for a walk. The snow was melting, and the sky was very very blue. In fact, the sun was shining and it seems as if winter is letting go ... Also, kinda dramatic.. its the middle of January and winter is here to stay for 3 more months.... yay winter. Nevertheless, out I went with my tiny little Pentax point and shoot. I see little birdie foot prints on the deck under the table. The sun is shining on the lantern and some dry grass and the Virginia Creeper on the garage. This is the little White Spruce that emac brought home from elementary school a long time ago, peeking out from the snow... It lives! The back yard birch tree. It is called Purple Rain Birch and in the summer its leaves are almost black. That white bark looks pretty against the BLUE sky today. This is one of the crab apple trees. It keeps it's fruit all winter long, unless the squirrels eat it. Its flowers are a beautiful shade of pink in May. At this point I was ready to go in the house and read the mail, have a coffee and upload my photos. Once inside, I looked out the front window and saw the big beautiful Northern Flicker in the Mayday tree. If you have ever seen a Northern Flicker, you would know how excited I was and hopeful that I could take a picture of it. Flickers are a type of woodpecker, with the most amazing feathers. Have a look here: Northern Flicker. By the time I got outside again with my camera, she was gone. He hopped from branch to branch, not at all shy of me there filling the bird feeder with seeds. 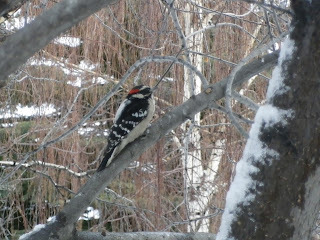 Finally, he flew right up close to the other little hanging feeder, the one designed for woodpeckers. 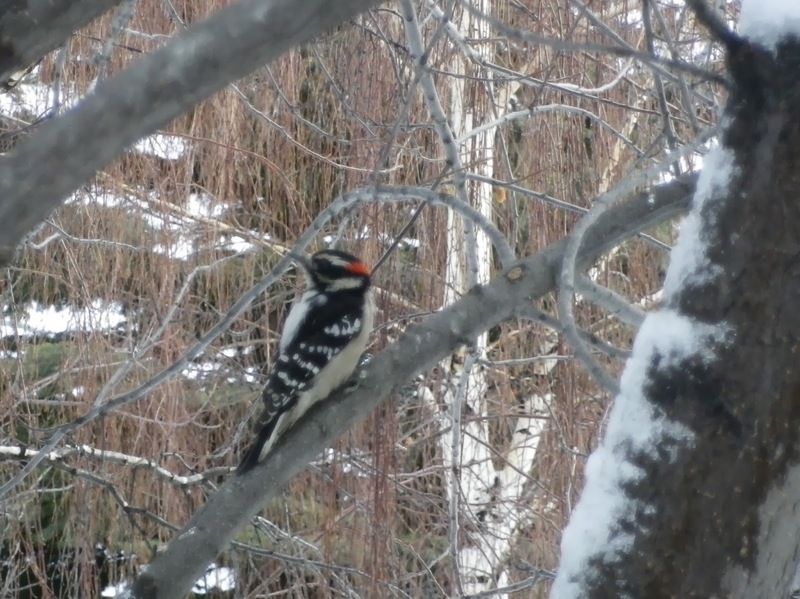 As I finish this post, I see my new little friend is still out there, pecking away. I guess he was hungry! Maybe I will see him again. Today, I am a back yard Druid, there are so many wonderful things to see if you only take the time to look for them. Birds flock to the druid!